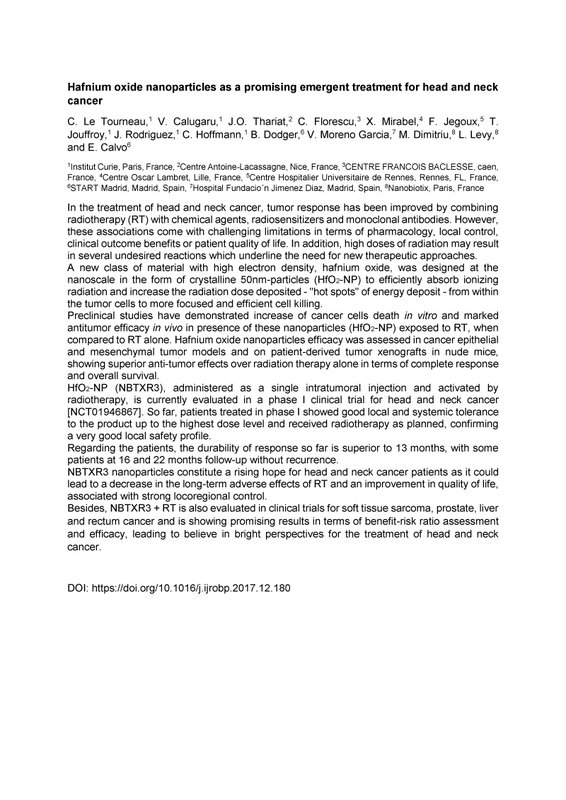 Multidisciplinary Head & Neck Cancers Symposium, Scottsdale, Arizona, USA · 2018, Le Tourneau C. et al. NBTXR3 administered as a single intratumoral injection and activated by radiotherapy, is currently evaluated in a phase I clinical trial for head and neck cancer [NCT01946867]. At the 2018 Multidisciplinary Head and Neck Cancers Symposium in Scottsdale Arizona, preliminary results were presented by prof. C. Le Tourneau. So far, patients treated in phase I showed good local and systemic tolerance to the product up to the highest dose level and received radiotherapy as planned, confirming a very good local safety profile. Regarding the patients, the durability of response so far is superior to 13 months, with some patients at 16 and 22 months follow-up without recurrence. NBTXR3 nanoparticles constitute a rising hope for head and neck cancer patients as it could lead to a decrease in the long-term adverse effects of RT and an improvement in quality of life, associated with strong locoregional control.